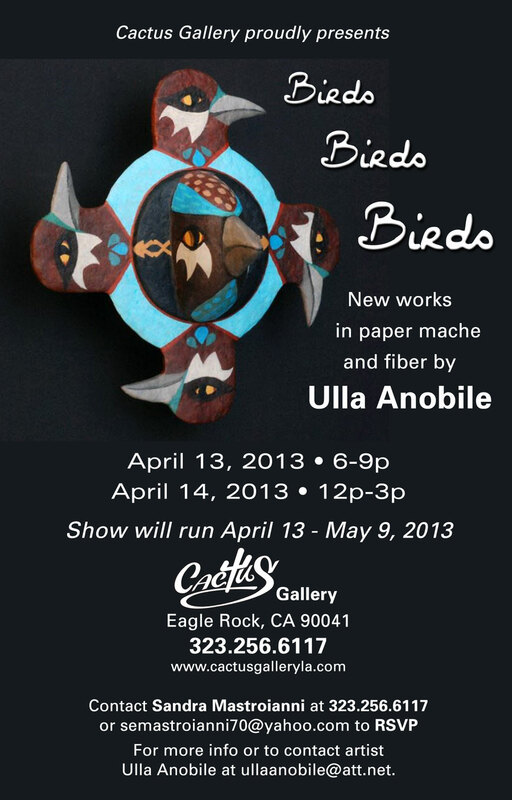 We are pleased to present artist Ulla Anobile's newest series, BIRDS BIRDS BIRDS, a Springtime installation of paper mache and fiber works. Ulla's inspiration for this series stems from birds whether as symbols of freedom, flight, soul, ancestral spirits, messengers, carriers of omens or simply just the element of air. 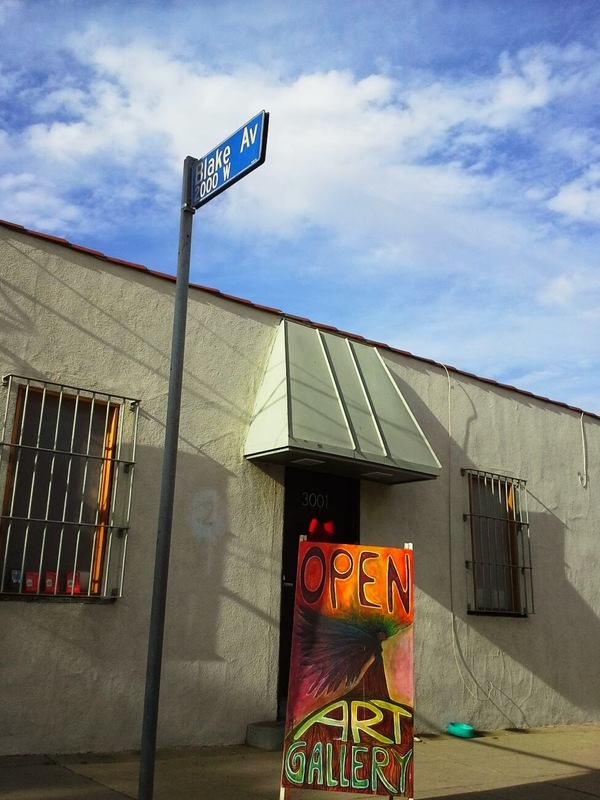 Contact Sandra at semastroianni70@yahoo.com or at 323.256.6117 for purchase or commission info. 7 1/2"" x 8" x 1 1/2"
20" x 4 1/2" x 2"
9 1/2" x 9 1/2" x 1 1/2"
9 1/4" x 10" x 1 1/2"
10" x 10" x 6 1/2"
11 1/2" x 8 1/2" x 2"
3 1/2" x 9 1/2" x 1 1/2"
10 1/2" x 6" x 2"
7 1/2" x 3 1/2" x 1 1/2"
10" x 5 1/2" x 1 1/2"
9" x 5 1/2" x 1 1/2"
The bird as a symbol can mean many things: freedom, flight , soul, an ancestral spirit, a messenger , a carrier of omens, or just the element of air. According to the late archeologist Marija Gimbutas, the bird is also an aspect of the ancient Mother Goddess. All this was on my mind, when I worked on my ANCIENT BIRD series. The start, though, was more prosaic: I had a long piece of found wood, which I broke into four parts: the tails. I decided the paper mache body had to be squat and flat, the wings extended, to accommodate the various symbols and markings. I simply chose symbols and runic letters that intrigued me visually, but some meaning might have wiggled into in the random combination of markings. There exist several runic tables, and the interpretations of runes vary. I used those found in Barbara G Walker's book 'The Woman's Dictionary of Symbols & Sacred Objects'. ANCIENT BIRD #2 - 9 1/2" x 9 1/2" x 1 1/2"
The rectangular image in the center of the chest can be seen as a form of the 'mappa mundi', a depiction of the world as having four corners, and the crossing lines in the center, the crossroads. On the wings: various triangles and lozenges, both often found on statues of the goddess as the water bird. Top of the tail: a rune called 'hagel'=hail, snow. Below it: the rune for 'rad'=journey or ride. The droplets on the left wing and the tail of course indicate moisture and/or rain. ANCIENT BIRD #3 - 10 1/2 x 10" x 1 1/2"
The bottom part of the body houses an asymmetrical labyrinth/spiral, a form I am very drawn to, so it shows up in many of my recent art pieces. The spiral has been used since prehistoric times to express cyclical movement, whether in the outer cosmos or on this earth, as in the repeating change of seasons. The Jungians also see it as symbolizing the development of the innermost psyche. On the tail: rows of lozenges. The rest of the markings are simply me playing with a multitude of colors and lines. No runes found here. ANCIENT BIRD #4 - 9 1/2" x 10" x 1 1/2"
On the body: four runic letters. Top: 'feoh'=cattle; right side; 'sigel'=sun; bottom: 'eolh'=defense (also can be seen as a crow's foot); left side: 'os'=god. On the left wing: more lozenges and stripes. On the right wing: more labyrinthine meanderings. 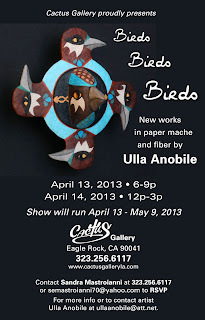 Ulla's paper mache/fiber work is inspired by such folk art forms as the mask, the doll, the totem and the altar. Her ideas come from dreams, mythology and folklore, as well as from childhood summers spent in the unspoiled Finnish countryside. Her work often emphasizes the spiritual aspect of nature. Birds and owls, both mythical and real, are among her favorite subjects. Her sculptural masks have been included in reviews of contemporary mask making at the Anchorage Museum of History and Art in Alaska, The Clymer Museum in Ellensburg WA, Pico Rivera Centre for the Arts, the City of Los Angeles World Airports Exhibition Program and Pierce College, CA. She was invited to make a one-of-a-kind ornament for the White House Blue Room 1999 holiday tree. She has participated in solo and group exhibitions in galleries and museums throughout the United States as well as in England and Finland. Ulla, a former journalist, was born in Helsinki, Finland. She has lived in Los Angeles since 1975.